This beautiful black wood ring was lovingly designed by a fellow in Scotland for his sweetheart. He sent us the crushed lapis lazuli which David incorporated as an inlaid band on the grenadilla wood. 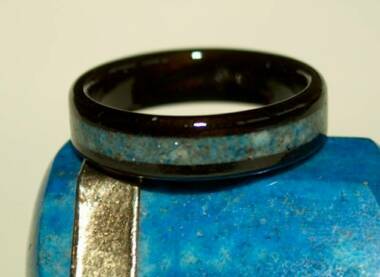 This ring to the left is created from rosewood with a kauri liner and lapis inlay. Other folks have custom designed their wood rings to feature bands of sand, crushed shell, crushed crystal, stone . . .